The "Black Widow" pulsar is zipping through the galaxy at a speed of almost a million kilometers per hour. A bow shock wave due to this motion is visible to optical telescopes, shown in this image as the greenish crescent shape. 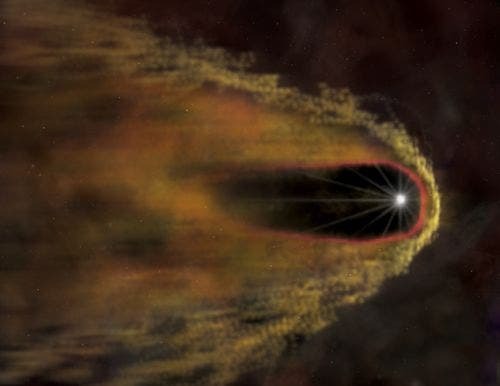 The pressure behind the bow shock creates a second shock wave that sweeps the cloud of high-energy particles back from the pulsar to form a cocoon. 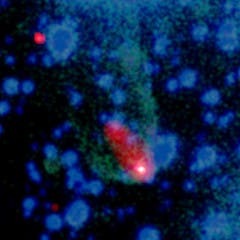 The Black Widow, a class of extremely rapid rotating neutron stars called millisecond pulsars, is emitting intense high-energy radiation that appears to be destroying a companion star through evaporation. These objects are thought to be very old neutron stars that have been spun up to rapid rotation rates with millisecond periods by pulling material off their companions. The steady push of the infalling matter on the neutron star spins it up in much the same way as pushing on a merry-go-round causes it to rotate faster. The advanced age, very rapid rotation rate, and relatively low magnetic field of millisecond pulsars put them in a separate class from young pulsars, such as the Crab Nebula. Yet the Chandra data show that this billion-year-old rejuvenated pulsar is an extremely efficient generator of matter and antimatter particles, just like its younger cousins. The key is the rapid rotation of B1957+20. The Chandra result confirms the theory that even a relatively weakly magnetized neutron star can generate intense electromagnetic forces and accelerate particles to high energies to create a pulsar wind, if it is rotating rapidly enough.